For me, these are the best days. The days, weeks, and month or two before the release of a new record, when all is possible, nothing is out of the question, and everything is up for grabs. The best days. Like the weeks before Opening Day, or the walk up the front steps to pick her up for that first date. High hopes and higher expectations! Or, if you’ve had your share of major hurts and disappointments, have seen the Gates Of Hell welcoming you once or twice, and/or have gone to bed unsure of a new day coming at all, then every new breaking dawn is that set of illimitable golden possibilities. I’m somewhere in between. While I have certainly been knocked down once or twice – or thrice – by the music biz, in the long run I have proven to be either too tough, or perhaps (as others might suggest) too stupid, to stay down. I just keep coming back, and I keep trying harder, and harder still. But this day, right here and now, is a living metaphor for why I keep getting back up and in the game. These are the best days. No one has fucked up: not myself, not anyone on our team, and not anyone else whose hands will be getting their fingerprints on our record. Everything and anything that could go wrong has, to this point, yet to go wrong. The world is brand-new dime shiny, vibrating, alive and breathing. This actually could be the one! This really could be our year! Our best chance yet! It’s out there – I can feel it!! Actually, I do feel it! These are the best days. For the first time since, I think, 1989 (or 1990? ), there is a new Del-Lords record, ELVIS CLUB, about to hit the streets, and wave hello to the planet. I have been writing, posting, blogging, and talking about this record for a few years already, but I am actually holding a copy in my hands right now! Future-Now! Yes friends, it took awhile (a true statement, which I am sure does not exactly constitute breaking news to our fans and friends – or to my wife, for that matter). But, with these exceedingly weird times as backdrop to a crumbling, hard to define, record industry, it is very difficult for a bunch of grown-ups to just put a month or two of their lives on hold to work on a record with complete tunnel-vision, doing nothing but work on that record – especially if your goal is to own the record (which is essential to us) yourselves. Those days are gone, friends. We did what we had to do. The record biz died of a self-inflicted wound that first occurred the day the very first record contract was signed. It was just a matter of time. And, that time has come. But, while the recording process for ELVIS CLUB was spread out over a few years, we didn’t actually spend a ton of time recording or mixing, or even fretting. We recorded pretty quickly, actually – we being Frank, Eric and myself, and a handful of bass players taking over Manny’s old gig – certainly nothing ever felt labored or stagnant. Eric – in the role of producer for the first time regarding The Del-Lords – kept it all where it needed to be, and knew what needed to be done when, and came up with lots of great song arrangement ideas, too. He also kept the all-important Big Picture in sharp focus. Ideas were always in the air, with everyone throwing down in that regard. And, the execution was fast, whether it was a guitar part, percussion, vocal idea, or whatever – it took a few takes at the most, and that was it. Playing together in the same room – as Cowboy Technical Services has no control room, ALL involved are in the room with the console – we were really able to play together, hearing and feeling it in a way that was a new recording studio experience for us. I still remember the instant connection I felt with Frank and Eric within the first couple of minutes of the very first time we played together back in 1982, and there it was again this time, right off the bat. That connection still remains, and is a wondrous thing between the three of us. This set-up really helped us double down on that feeling, stoke the fire, and keep that vibe heavy in the room. A quick historical note (since I brought it up): the first time I ever played with Frank is also the first time I played with Eric, too. Coincidentally (fortuitously? cosmically? ), they both auditioned for the band at once, AND at once, it was obvious, by which I mean IT was obvious – the band was born right there. For the record, it was the arrangement of FOLSOM PRISON BLUES that appears on our compilation cd, GET TOUGH, that was the first song we played. Most of these songs were written over the course of what I call The Time of the Deep Descent and Eventual Soaring Ascent that sums up my life during the years 2008 to present. They are all from a big batch of songs I had written over the last five years, with a couple having been around for a longer while – songs whose time had suddenly come. Eric sent me this big fat and greasy Blues Rock lick that became YOU CAN MAKE A MISTAKE ONE TIME. EVERYDAY is one I originally wrote with my friend, Dion DiMucci, for what was then a screenplay for what was to be a Dion bio-pic, written and directed by Chazz Palmintieri. Neil Young’s SOUTHERN PACIFIC was a last minute idea of Eric’s, and it just immediately felt perfect, as it is a song we have been playing since the earliest days of the band, and that fit in well with the overall concept of this record, too. And, now the record is imminent. I wear an ear-to-ear smile these days. Every little thing is so good. My house is indeed a home and sanctuary, my one year-old artificial knee has completely changed my life for the better, I feel GOOD! And, the band, Elwood, THE BAND!!!! These are the best days. And, they’re about to get better. 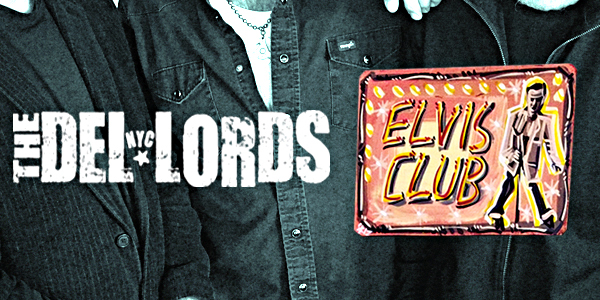 “ELVIS CLUB” is in stores on the 14th of May, and out now on iTunes and Bandcamp. Pre-order the CD on the “store” page. Thanks for such a great inspirational blog page! I too, have been knocked down a few times by the music biz but like you I get up again…no matter what cause I love music and I love to sing! Had the great honour of sharing a bill with you recently in Hamilton Ontario (I was in the Evelyn Dicks). I really hope you and the Del-Lords can make it up to Canada…we’ll all be there with bells on! Elvis Club slots in so well with the other albums that it’s ridiculous. Feel just as stoked as you, Scott, on new music from the Del-Lords!! Praying you guys tour comes nearby so I can FINALLY see one of my all time favorite bands live!! Keep Rockin’!! Great post, Scott! You captured that feeling of optimism once the album is done and you’re happy with it so well (I was there about this time a year ago). Can’t wait to hear the album and am gonna pre-order it right now!